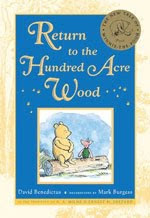 Brimful Curiosities: All new Winnie the Pooh book releases soon! Read the first chapter. How exciting. I wonder if it will have the same feel and charm of the original. I wouldn't want to be in the author's shoes, trying to take over for A. A. Milne. Or maybe I would. We'll definitely be looking for this one when it's out. My husband is a huge fan, and we have at least two sets of the original stories for our son, even though he's too young to enjoy them. My 14 year old daughter loved Winnie the Pooh when she was 2-6 years old. Loved it. Would snuggle with Pooh, watch Pooh and have Pooh read to her. My other children never really got into PoohBear. Interesting. The First chapter appealed to me. A bit too long for my little ones but my 10 year old may actually give it go...maybe. Thanks for this post. I do hope that this book lives up to the original Winnie the Pooh stories.